The Cover Contessa: JUST BECAUSE GIVEAWAY! Just because I have A LOT of books that I need to give away. And MANY of them are signed. SO I figured I'd do a random giveaway for everyone! You can win 2 of the signed books in the pictures below if you are a US resident, 1 if you are international! Please excuse the quality of the photo! Every book in the picture is signed by the author! Hi, has a winner been posted for this? I'm sorry to be a pest, but this giveaway was great (actually had books that I really want / like); otherwise I wouldn't even ask. Thanks! Great choice! It's a fantastic book! Pretty great books you've got there! If I were to win, my picks would have to be Infinite and Uninvited. Thanks for the giveaway! I'd go for the Infinite ARC. I would choose Daimon! :) Thank you for the giveaway. I'd choose Uninvited and Daimon! Thanks for the giveaway!! I would choose Whisper falls. Uninvited! I loved that book and would love to own it. Thank you so much. I really don't know. I'd like to have all of them! :D However, I would choose Infinite or Uninvited. Terri it is! Good luck! I'd choose Uninvited ! Thanks for the giveaway!!! Btw, the twitter handle on the rafflecopter is incorrect. I was surprised when the twitter page didn't show up as I was following you already. Ooo I'd choose Independent Study and The Uninvited!! I think I'd pick Uninvited and/or Infinite. Thanks for doing this giveaway! I think I would pick Invisible or Independent Study. Thank you! I would pick Independent Study or Infinite! Thanks for the giveaway. I'd choose the ARC of Invisible. Thanks for the giveaway! Such great ones! My choice would probably be Uninvited. Independent Study....I loved this series and I don't have a copy since I read the copy I borrowed from the library. Thank you so much for the giveaway! I'd pick Uninvited and Daimon. Jaclyn @ JC's Book Haven. I think I would pick Uninvited. Thanks for the giveaway! I'd choose Uninvited. Although Daimon is also calling my name! Decisions, decisions. I am thinking Whisper Falls or Uninvited because they are the first in the series. Although all sound good. It's very tough. Infinite or Uninvited ;) Thanks for the random giveaway. I think I would choose Uninvited. It sounds awesome. 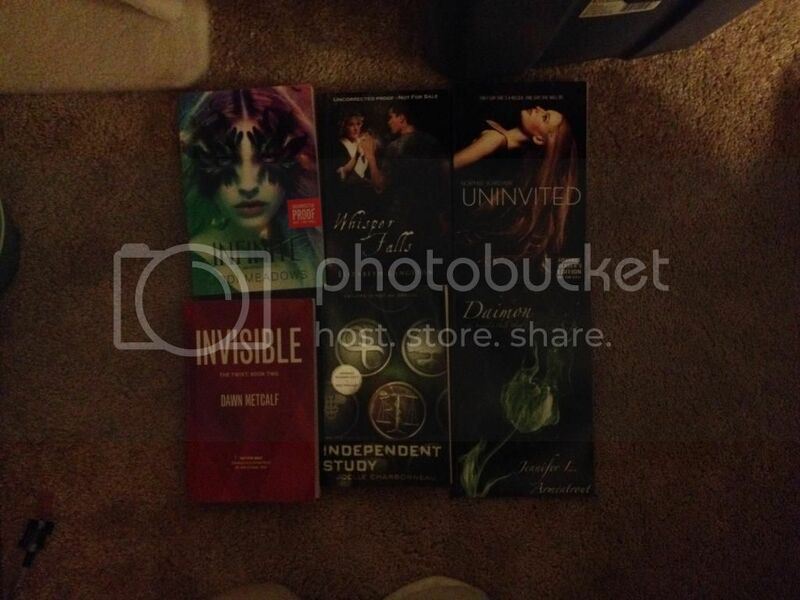 I would love to get the Uninvited ARC :) Thanks! The winner is listed on the rafflecopter above.